“Persona or mask: nothing under it except another persona, but still important to know that we are playing roles.” Holograph note Frye scribbled at the end of a typescript of some notes for a talk. 1991 accession, box 36, file 1. 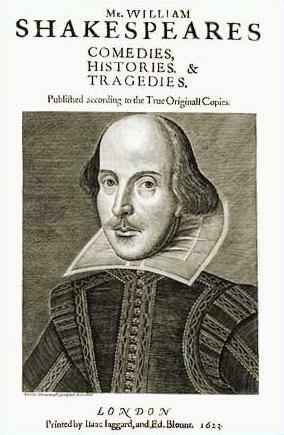 “As Hamlet proves in its soliloquies, we dramatize ourselves to ourselves even when alone.” From Frye’s CRTC report. This entry was posted in Bob Denham, Quote of the Day on April 23, 2010 by Bob Denham. Well, I survived my 11th Soirée Frye and despite the public humiliation, I am relatively unscathed. My co-host Mario Thériault was up to his regular tricks of pointing out just what an uptight, snobby upper Canadian I am! It was just so nice to have all the students there, basking in the glory of winning the Frye Writing Contest, and for them to rub shoulders with all the invited authors. One student from Fredericton High School (Stéfanie Violette) who won second place in the short story category planned to stick around town, taking in some workshops and readings today. We try to match members of the community with the authors, finding just the right fit, and I know that some terrific friendships were formed last night between authors and their escorts. This morning began in the best way possible: driving Linden MacIntyre to CBC’s Information Morning. What a wonderful man. He is very impressed with the Frye Festival and believes that we need to do a much better job of selling the rest of the country on our unique spin on a literary festival, so of course I’ve been thinking about that all day! Getting some substantial and meaningful national coverage will be a major goal for us for 2011. After driving Linden and then Nino Ricci (I got them some Tim Horton’s coffee on the way since the coffee machine with the Coffee Mate (yes, this still exists!) was just too terrible!) I ferried them back to the hotel for school visits and picked-up Noah Richler. What professionals. Each one of them was in the lobby at the precise time with a smile on his face. Local children’s author Jennifer McGrath-Kent joined me to discuss KidsFest, finishing up the day of “Frye-Day” programming for Information Morning. When I was leaving CBC (for the last time!) I ran into Dominic Langlois, one of the featured authors from “Prelude: Emerging New Brunswick Authors” and he took the time to tell me how much he had enjoyed the experience and how thrilled he had been to participate. 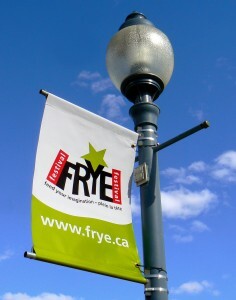 This entry was posted in Frye Festival on April 23, 2010 by Guest Blogger. It’s Frye-Day and CBC Radio’s local morning show is completely devoted to the Frye Fest, with information and interviews with authors. I’m listening now to Linden MacIntyre being interviewed. He’s talking about his own early life and relation with the Catholic Church, and about his life as a writer. He’s picking up on the theme of yesterday’s roundtable, “Stories, and What They Do,” talking about what fiction can do that no other form of writing can do. He’s talking about his own religious upbringing, and his understanding of the Bible, as stories and metaphors, perhaps without Frye’s great faith in the power of myth and metaphor. Next up on CBC will be Nino Ricci. Nino, Linden, and Annabel Lyon will be featured this evening at an all-English event, with Noah Richler as host. We call it “An Evening of Canadian Lit.” Most events are bilingual, French authors and English authors alternating. Tonight’s event is all English, making a special appeal to English speakers who find all they can do with French authors usually is look and not listen. Block it out. Tonight we make it easy for them. At noon today I’m looking forward to the roundtable “Writing Lives and Afterlives” with Noah Richler, Daniel Poliquin, Nino Richler, and Maryse Rouy. The discussion will be about the relation between historical figures (famous or not) and the narratives (fictional or biographical) that writers create. Jean Fugère will be moderator. Fugère, from Quebec, has been coming to the Frye Fest for many years now, serving as moderator, MC, and interviewer. He’s always well prepared, well read, and has a great ability to ask the right question. I missed his interview yesterday with Noah Richler, occupied as I was with the very pleasant task of keeping Annabel Lyon company at dinner, along with my wife and a friend. Nino is talking now, mostly about his Trudeau biography. The narrative arc is from conservative, reactionary early Trudeau to “independent” and “outspoken” later Trudeau. Public persona was arrogant; privately, friends thought him too shy even to get into politics. It’s a brief interview with Nino, now over. No discussion of “Origin of Species” or anything except the Trudeau bio. Somewhat disappointing in its narrow scope, but good publicity for today’s roundtable and tonight’s event. This entry was posted in Frye Festival on April 23, 2010 by Ed Lemond. My day began with minor crises…losing an author (but then finding him! ), illnesses in an author’s family, resulting in her cancelation, and a sick volunteer/KidsFest coordinator, but all was solved by noon. The authors are arriving and it is so much fun to meet them (and match them with their much younger author photos!). The Festival Bookshop is open for business and there are piles of books just waiting to be purchased. The noon-time round table was insanely eclectic, but worked incredibly well – where else would you get a doctor/novelist (Martin Winkler), a philosopher/novelist (Annabel Lyon), a Quebecois radical rapper/novelist (Biz) and an investigative journalist/novelist (Linden MacIntyre) all together talking about Stories and What They Do? The crowd was very happy (even though we ran out of simultaneous translation devices, for the first time ever!) and seemed so delighted to have had the opportunity to feed their imaginations in this way. The book club with Steven Galloway was absolutely terrific! What a great guy! Steven is completely down to earth, modest and quite funny. The two “interviewers” (Suzanne Pelham-Belliveau and Laura Nicholson) did a great job of setting up the discussion and then Noah Richler, an audience member, stirred the pot! What great fun. I could have listened to Steven all day. He made us all think about civilization and what it means; the small things that we do every day to maintain our part of the “civilized” bargain. I’m preparing right now for Soirée Frye, our annual evening extravaganza. I’ve been selling it this year as the ideal event to which to bring the “reluctant” Frye fan. We will see. We sent out tons of invitations and the event is “pay what you can”, so I’m hopeful that people will pack into our beautiful Capitol Theatre. There are four authors on the schedule, including Nino Ricci and Christian Bök (who arrived on the red-eye at noon today, looking exhausted!). Also, in our ongoing Frye Festival tradition of bringing an Anglophone and a Francophone musician together for the first time ever, we have Juno-winning Julie Doiron and Guillaume Arsenault on stage. As well, we will award $3,500 in prize money to high school students who have won our annual Frye Writing Contest. We also donate $1,000 to two winning schools for the purchase of new books. I’ll be on stage with my co-host Mario Thériault, which probably means public humiliation for me, but hey, all in the name of literature! The reception to follow will be fun since all the authors will be there (they are all accompanied by members of our community) and there is talk of a big party afterwards…but I’m taking authors to interviews at CBC’s Information Morning at 6:40 tomorrow morning, so I don’t know how late I’ll be out! Today is traditionally regarded as Shakespeare‘s birthday (1564 -1616). A clip from Peter Brook‘s great film adaptation of King Lear after the jump. 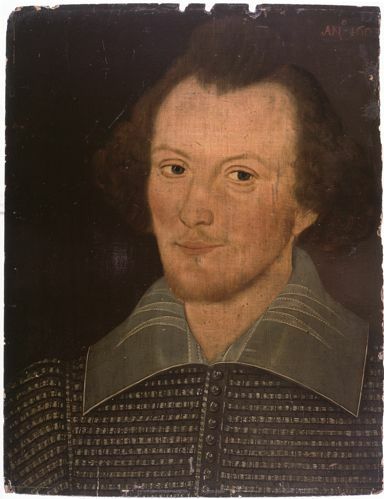 This entry was posted in Birthdays, Shakespeare on April 23, 2010 by Michael Happy.